I was hoping that moving to a newer car would allow me to avoid things breaking for a while, but apparently I was mistaken. A few days ago the passenger side window decided to stop rolling up. The windows are power windows, so it could be a couple of issues. 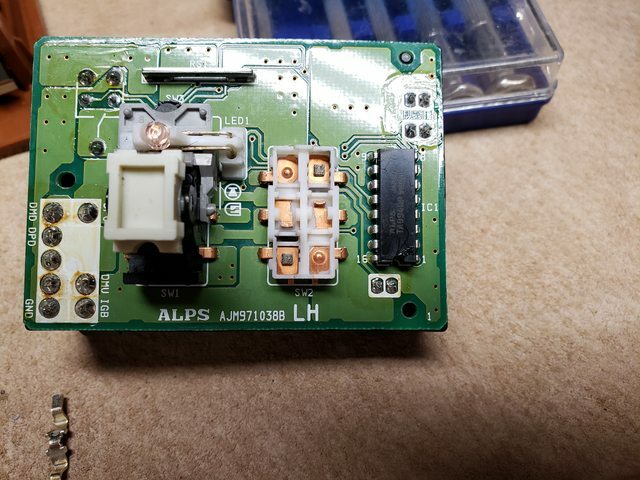 According to the forums there is a common issue where the window switch module has bad solder joints on the connector. So I took the center console apart and pulled out the switch module. Taking it apart and inspecting it revealed no obviously bad solder joints, but I re-flowed all the pins anyway. 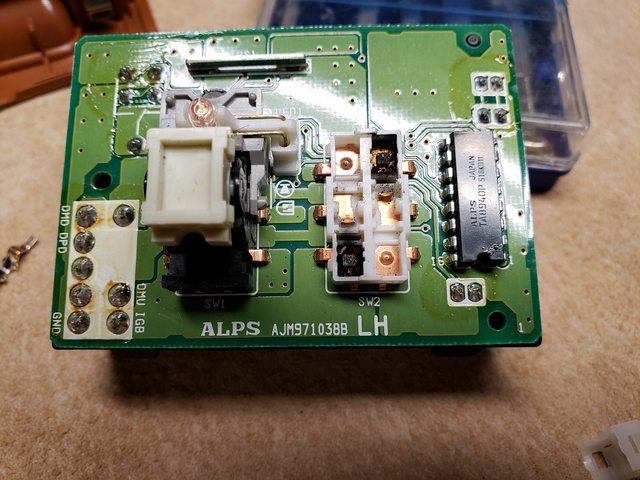 Plugging the switch module back into the harness in the car and trying to close the passenger window showed that the problem still existed, so I guess that wasn’t the cause. Pewp. I decided the next troubleshooting step was to pull the door panel off and try and operate the window motor by directly applying 12V to it. 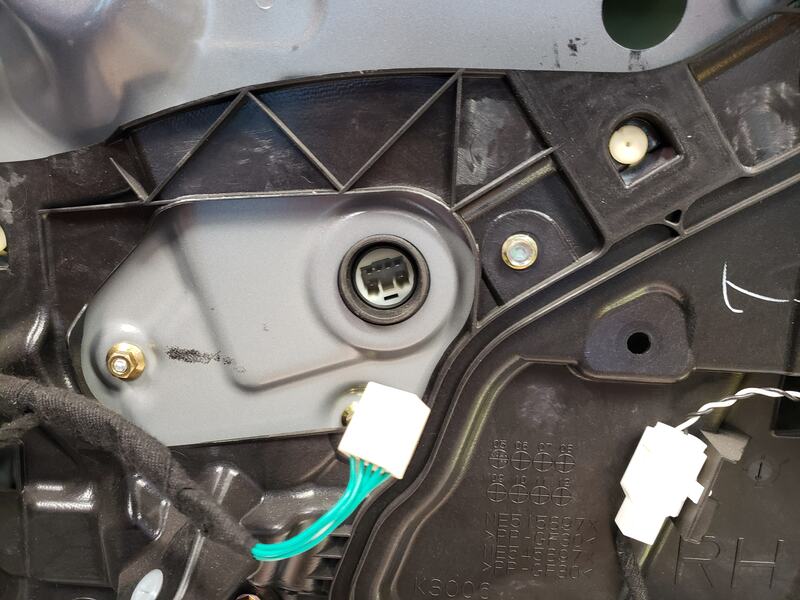 Pulling off the door panel was no more difficult than other cars – remove three screws and pull the panel until the panel clips pop free. Once the panel was off, the window motor connector was easy to access. To test it you need a 12 volt power supply, or a battery. I had a spare motorcycle battery laying around which worked great. The lower outer pins are the motor pins. You need two jumpers. If you apply positive to the left pin and ground the right pin the window will go down. Reverse the polarity and the window should go up. Mine went up and down just fine, so it wasn’t the motor. I left the window in the middle and plugged in the connector again, then I tried the switch. The window went down, but not up, same as before. Since the motor worked with direct power applied, it must be the switch. So I reassembled the door and took the center console apart again. I disassembled the switch assembly to do some more troubleshooting. 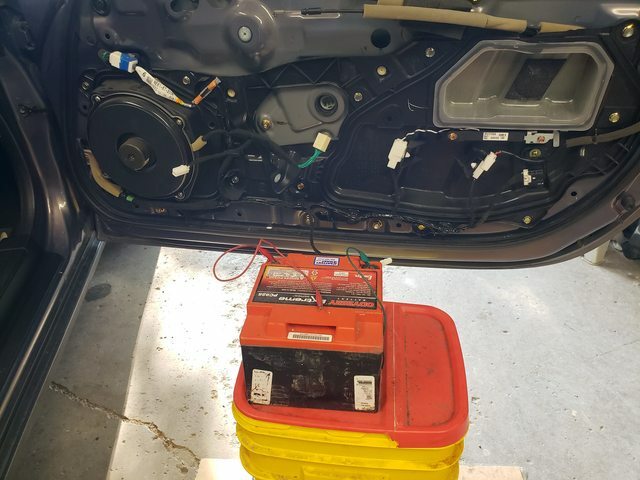 I took my multimeter and checked out the drivers side switch. Lifting the switch and probing the terminals determined that the center terminal on the left and the lower right terminal were connected when rolling up the window. Testing the same terminals on the passenger switch showed that the terminals were not connected when the switch was lifted up. So the switch is bad. Since the switch was bad anyway I decided to open it up and take a look. I carefully pried the top off, removed the two switch bars and was greeted by with this sight. Well there’s yer problem. Look at all that carbon from arcing. I cleaned the switch body and the two switch bars with some contact cleaner and rubbing the contacts with a small popsicle type stick. They cleaned up really well. I lubed up the contacts and the pivot points with a small application of dielectric grease and snapped the switch back together. Testing with the multi-meter showed that the switch was working correctly so I went out and plugged it into the harness to test it. It worked! Saved myself the cost of a switch assembly (about $90)!